Infinity Symbol Jewelry Pieces We Are Enamored With! Infinity. What does that mean to you? The infinity symbol comes from so many different backgrounds, but it always ultimately represents the same thing. Never ending. Forever. Constant. It has been said that the infinity symbol was used to be a variant form for a Roman Numeral of 1,000. They would sometimes use this symbol to say ‘many’. Many years, many days, as many as there can possibly be. This philosophical concept at the time was far beyond reach, but the idea had been planted. The infinity symbol made its official debut in the late 1650’s when it was first used in mathematics by John Wallis. Of course in mathematical terms, we know it to be an endless quantity, larger than any real number. This symbol is used in science, in religion, and many other places. Some of these may seem familiar to us, and others not so much. But there is one time the infinity symbol is used that all of us can understand, and that is when it comes to love. This endearing symbol means forever love, commitment, and admiration. When you think of this symbol, you may think of your significant other, your family, or your closest friends. The infinity symbol represents a boundless love. It represents the deepest and most long lasting relationships in our lives, past, present, and the forever future. 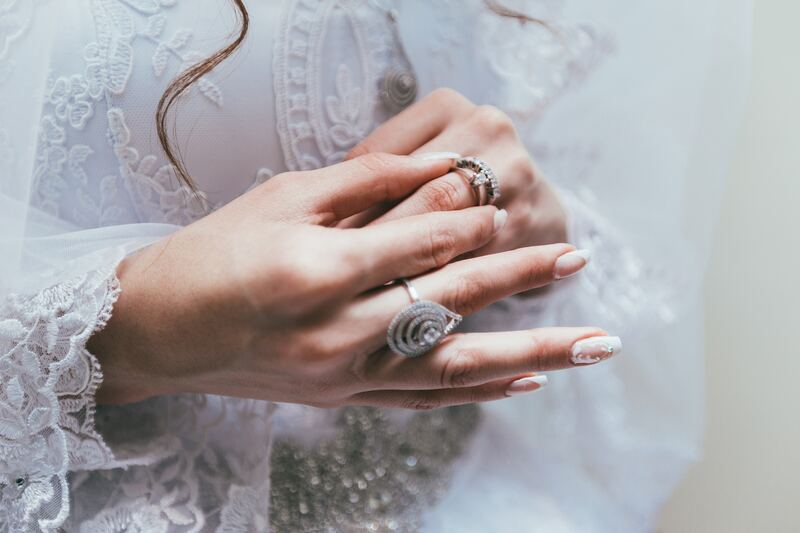 Jewelry is such a beautiful way to keep those perpetual relationships close to our heart and on our mind everyday, whether we see that person regularly or not. Whether you wear it yourself, give or receive it as a gift, you can be sure that the sentimental message is always the same. You are loved, admired, and trusted. Your relationship is cherished. It is forever. It is boundless. There are abundant options out there to display this bounteous love. What kind of jewelry is your favorite, the one you just can’t start your day without putting on? For some of us it is a ring, maybe a bracelet, or your favorite pair of earrings. Maybe you switch it up depending on what you are doing that day, or even that time of day. Regardless of your preference, you will find gorgeous options that you will fall in love with. Whether your style is showy and bold, or simple and dainty, you can boast your sentimental infinity symbol every day! 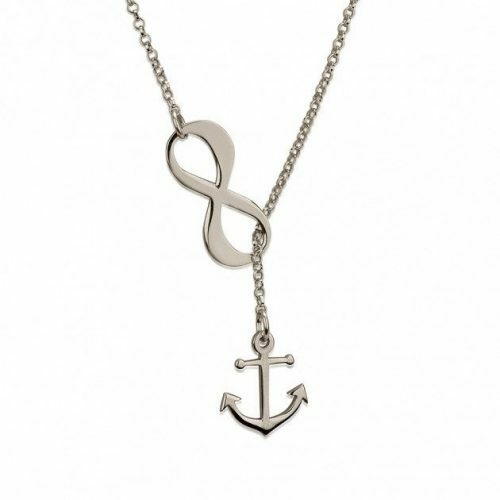 We have rounded up our top ten infinity symbol jewelry pieces that we are completely enamored with! Let’s take a look. For starters, there is this gorgeous sterling silver ring. It is tarnish resistant and comes in sizes 4 to 12. It is priced so low, you will be anxious to grab a bundle of them for you and your closest girlfriends. 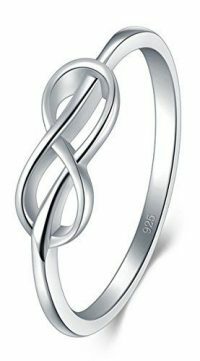 The way that they band continues through the infinity symbol from either side, truly gives it that never ending vibe in a way that stands out from your typical infinity symbol. This piece comes in an eco-friendly cotton bag, making it a sweet and simple gift without falling short of the sentiment that you want to share with your loved one. You know that ring that you loved when you were in Middle School? That Best Friend ring that made you feel like you really belonged to the group. You wore it everyday and most of the time at night too. But in just a few short weeks, or maybe if you were lucky it lasted a couple months, you ended up with a tarnished ring and a nasty green finger to now symbolize your friendship. 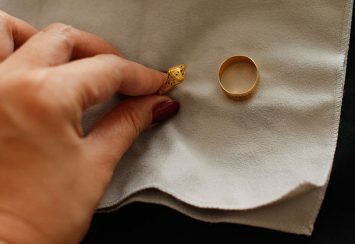 Don’t you fret, this ring is not going to put you through that same disappointment all over again. The true sterling silver is guaranteed not to turn your finger green, meaning you won’t be embarrassed by February when you send these out to all your best friends for Christmas, because everyone will still be admiring their dainty ring, rather than scrubbing their green finger. We cannot get enough of this classy little ring that is perfect for all ages. Whether you want one for your growing daughter or your grandmother, you are looking for a special ring for yourself, or for all of you college besties out there, this ring will bond you and your girls for years to come! This ring brings that feeling where your heart starts to race and your stomach slightly drops, in a good way. It is completely and totally swoon worthy! 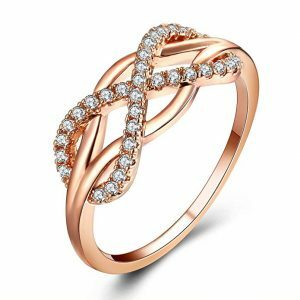 This cubic zirconia infinity symbol ring buts a whole new meaning to dazzle. It remains dainty with the simple band, but has the perfect pop of sparkle with the weaved in small round gems creating the infinity symbol. This would be the perfect gift for Mother’s Day, Valentine’s Day, a Birthday, or Christmas. The way it shines is sure to make your loved one smile. This ring is the type of thing you find and tell your significant other that you already ordered your Birthday present for yourself, so they don’t need to worry about it. As if it’s not perfect enough, you do have options for the color of the ring! You can find it in rose gold or silver plated and it comes in sizes 6 to 9. You are sure to get compliments as you add this to your outfit of the day. The sparkle will catch people’s eye, and each time it catches yours it will remind you of your special someone. This ring is a real bargain and comes in a nice gift pouch bag if you decide to share one or two with the impactful women in your life. This third and final ring in our jaw-dropping roundup is an absolute must have. The way that they have taken the standard infinity symbol and curved the edges into hearts is exquisite. As if that isn’t already the perfect modification to the infinity sample, they have laced in a gorgeous cubic zirconia gemstone heart to make it the perfect display of femininity. Can you even handle how big of a statement this ring makes? This outstanding piece is made of sterling silver that will hold up over time. As much as we love the idea of pairing this ring with your everyday look, it can be used for so many other situations as well. 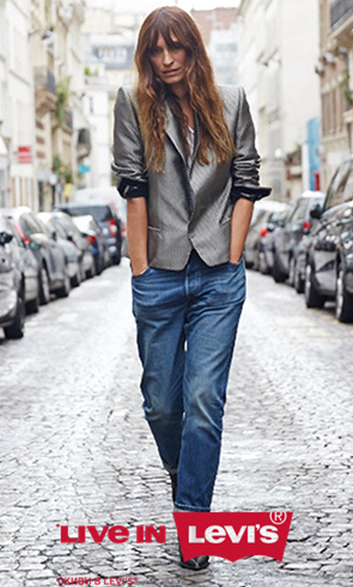 Add some sparkle and sentiment to your date night ensemble, or your girl’s night out attire. 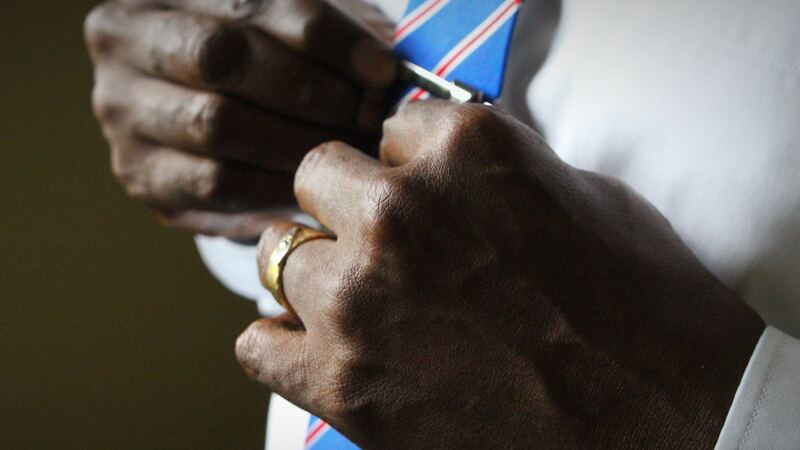 Beyond that, we also love that at its low price point, you can wear it as a substitute for your wedding ring if you are looking for something that still shines and represents your eternal love, without the risk of losing or damaging your expensive collection. Are you traveling for a work trip and you have a bit of a tendency to lose things when you travel through airport security? Do you have a job that requires hands on work and makes it a risk to wear your valuable jewelry everyday? Will you be swimming frequently on your next family vacation? This ring would be the perfect temporary replacement in those situations and any other time you need! Leave your wedding band and expensive diamonds at home, with no regrets, as you slip on this beautiful piece that will keep you feeling proud, loved, and a lot less concerned. 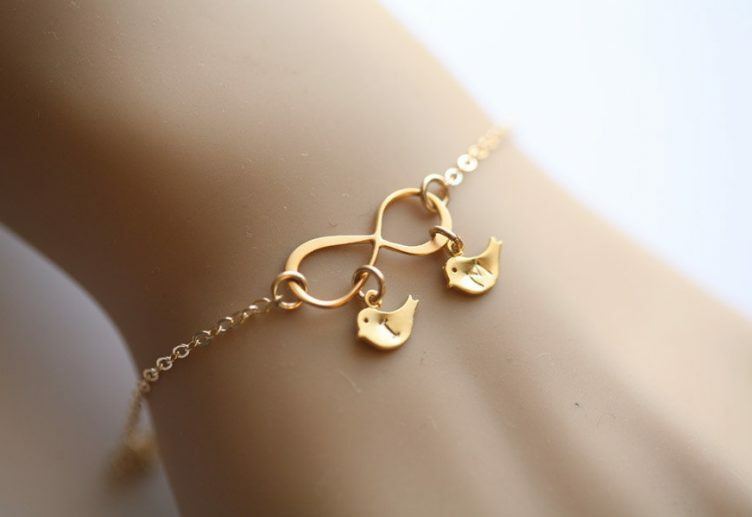 Here we have our first necklace of the ten must-have infinity symbol jewelry collections. How cute is this customized necklace? We are in love with the way it is set up. The sterling silver chain comes in three different options. We will talk more about that in a minute. Whatever option you pick, it perfectly leads you to the perfect sized sterling silver infinity symbol that is accented with two bar charms dangling off. This is sure to be the perfect symbol of your love or to give to someone to show them how much you care about your relationship. It is a true treasure! Let’s talk more about the chain. It comes in three different options as stated above. Each one is so dainty and you can’t go wrong with any choice here. The first one is a ball chain, offered in sizes (all in inches) 16, 18, 20, 22, and 24. The next one is your classic box chain, again ranging in sizes 16 to 24 inches. Lastly, we have the cable chain which is offered in those same five sizes as well. This may end up being one of those decisions that you just wish you didn’t have to make, because they are all charming! So which one will you choose? Maybe order it with your best friends name, for both of you, with different chains. That way you can choose from the two once you see them in person. Or maybe that’s just making things even more difficult. But seriously, we don’t think you can make a wrong choice on this one. Whether for you or for your loved one, it is sure to please! Let’s talk more about those darling charm pendants. You can customize them with any two names you would like. Is there any better way to announce your bond and keep it close to your heart? You and your best friend can wear them everyday, or you could put your significant other’s name on one charm with your name on the other. Are you a mom of two sweet babies (no matter how old they really are) or two special pets? Personalize your necklace with their names to always keep them close to your heart and wear your motherhood with pride! We love the idea of giving this gift to your mom, Grandma, or a friend for Mother’s Day or even a Baby Shower. It comes in a little box tie with a ribbon, making it easy to share. It is seriously one of the most charismatic necklaces out there and we are completely smitten by it, so we know you will be too! This necklace is one of our all time favorites. It is so appealing to the eye, and such a fabulous statement piece! You could easily wear it on its own, or layer it longer or shorter depending on the length you choose to customize yours at. This piece comes in 14, 16, 18, 20, or 22 inches. The pendant measures at just over an inch and a half long and about a half inch tall. It is available in sterling silver, yellow-gold, gold plated-silver, or rose gold and sterling silver. Each one is priced differently, but all coming in at a lower to mid-range price, and the yellow-gold is the most expensive of the four options. This is the type of necklace that will probably bring a tear to your partner’s eyes. Surprise her with a quality piece that she will want to flaunt day after day. This is the perfect gift for Mother’s Day, Valentine’s Day, Christmas, Birthdays, and especially Anniversaries. This lovely gift arrives in a pouch for easy gift giving. You can personalize it with up to two names, which we love the idea of putting his and hers, to show off your eternal bond. Each name is displayed in a fancy cursive font with the first letter capitalized. 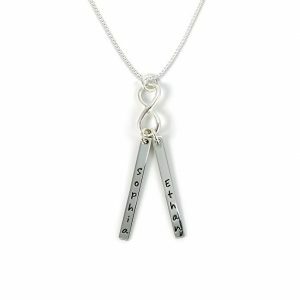 Because it is a customized piece, shipping may take a little longer than you are used to, so make sure to order this necklace in advance so that you can be sure to be prepared for that memorable celebratory day! Anklets are a style of jewelry that never goes out of style and we’re loving that they have been trending so much recently. We love how versatile they can be, from dressing up your fancy look to pulling off the perfect beach look, the anklet is always a good pick. 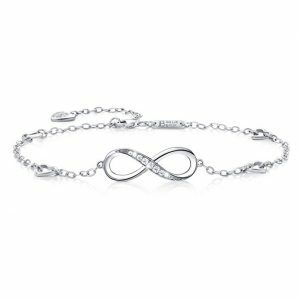 This infinity symbol anklet would be stunning on your wedding day. It would go great with your wedding dress, the perfect detail in that high heel shot we all have on our Pinterest wedding day board, and throughout the evening in your knee length getaway dress. Then it could easily transition to your honeymoon to walk on the beaches in your swimming suit and holding hands with your new forever companion. 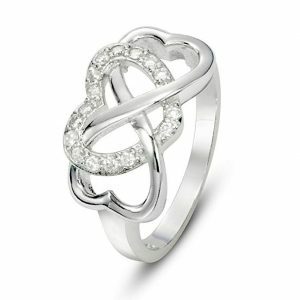 This piece is sterling silver with elegant white cubic zirconia gems enhancing the infinity symbol. The chain is separated by four delicate heart charms that make this anklet exceed all your expectations. When ordering, the size that you select will be the anklet at its shortest length, while including an extension chain that will ensure the right fit for you. The anklet is priced at a fair low to mid range, and one that you will not regret spending a little bit of money on. We love the way this bracelet mixes elegance with a casual look. It is so easy to pair with another bracelet, and to dress up or dress down. One of the most enticing things about this bracelet is that the band slides, rather than clasps. This makes it so that you don’t have to worry at all about ordering the right size, because one size fits most as the slide is adjustable. 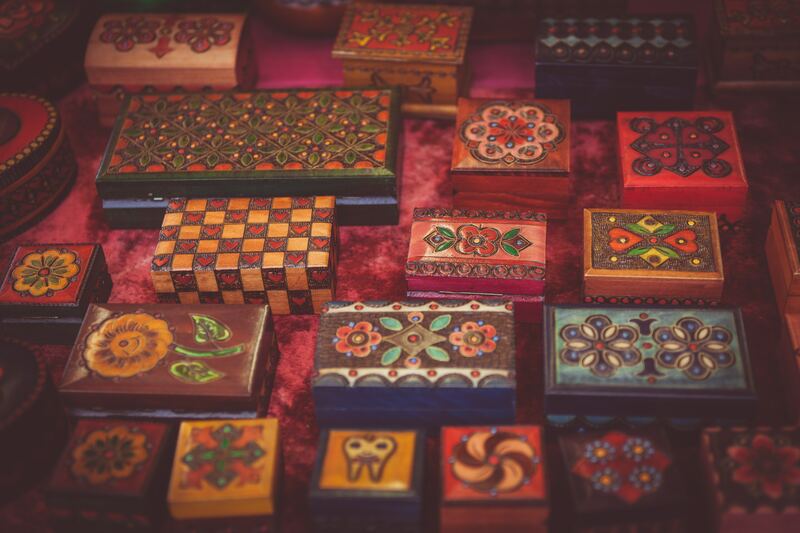 This also ensures that you would be giving a gift that could work for any of your friends or family members that you may want to share your infinite love with. 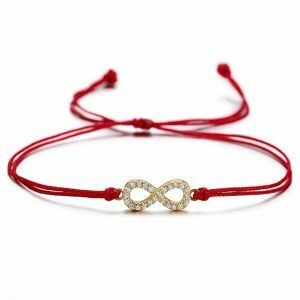 The infinity symbol bracelet comes with either a red string or a black string, both featuring the gold colored symbol lined with cubic zirconia gems. This band is budget friendly and may just leave you wanting more than one. Do you have a best friend? Was she the girl that helped you survive every awkward stage of elementary, middle, and high school, or maybe she’s the friend that completely transformed your college life? If we are one of the lucky ones, we may have met our best friend, or maybe a handful of them, at a point in our life that we needed her the most and she has stuck around through it all. What do you get a friend that has truly been your sidekick, your glue, your stability, and had your back through every tear and every smile? There’s no better gift, other than a girl’s weekend in Paris maybe, than this breathtaking necklace. We definitely think it deserves a spot at the top of the list as far as heart warming gifts go. We’ll talk about the helpful information for ordering this necklace soon, but first the details that make this necklace everything it absolutely has to be addressed. The chain link necklace is the perfect style to hold together this piece that features a clean infinity symbol pendant and a small pearl. That pearl. 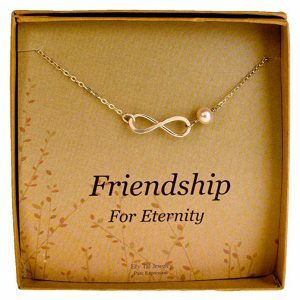 It is the epitome of dainty to really make this necklace magnificent and unique to your eternal friendship. We are in love with this design and we are willing to bet that your dear friend will be too! Okay, it’s time for the ordering information we promised. This necklace is made of sterling silver with a cultured freshwater pearl. It will not turn your skin green, which let’s be honest, is worth considering when you are planning to give it to someone so significant in your life or keeping it for yourself to represent that person and that friendship. The necklace is lead free, nickel free, and hypoallergenic. The chain is 19.5 inches, making it a good fit for any body type. The symbol is handcrafted and made in the USA. It’s priced very reasonably and also comes with a two year warranty on the chain. If it seems too good to be true, don’t worry, it’s not! It’s just the perfect gift or keepsake. Lastly, we absolutely love how fitting this style is for any age, truly making it the right gift for those forever friends in your life! Side by side or miles apart, Sister will always be connected by the heart. Isn’t that the truth? As many friends as you might have, whether they all remain constant now or they have been there throughout your past, there is nothing that compares to a loving and loyal sister. There is no girl bond greater than what is possible between sisters! 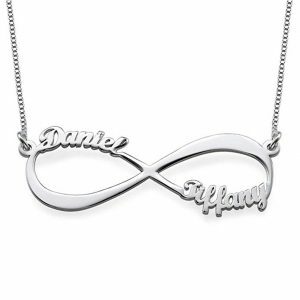 This necklace is such a tender way of portraying that forever bond. It is made of sterling silver and such a great quality that you can be sure to expect many years of wear out of it. It won’t turn your skin green or cause irritation, and as dainty as the chain is, it will not break or disappoint you. If you have any struggles with the chain, it has a lifetime guarantee and will be replaced for you. The price for this quality is marked just right and you will be proud to share this superb gift with your sisters, whether that be by blood or by choice. It comes with a 17.5 inch chain, working well for most body types. It is also a perfect length for layering a couple or even a few necklaces. 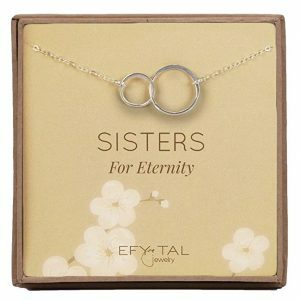 This necklace comes in the most adorable little box, when opened, displaying the piece with “Sisters For Eternity” written underneath. It is a necklace that your sister will be delighted to put on right away and keep on forever to show her devotion to your strong relationship. This infinity symbol is a little different than the standard one you may be used to seeing. It is two hoops that are interlocked to represent the bond of friendship and sisterhood. We love the way that one hoop is slightly larger than the other. It adds variety and character, but can also imply a special kind of interpretation that may be specific to your sisterhood. You obviously need to keep one of these for yourself to serve as an intimate reminder of your eternal sisterhood each day in your life. Along with that, you might just find yourself wanting to gift one or two of these gorgeous keepsakes. Grab one for your own sister, your daughters, or your tight knit group of friends that feel more like sisters. Wrapping up our top ten infinity symbol jewelry pieces that we are enamored with, we have this stunning set of earrings. These are absolutely dazzling and the way that the infinity shape leads to the tear dropped crystal dangle with leave your jaw dropping the day that you receive these and again every time you pull them out of your jewelry box. This earring are made from a rhodium plated brass and shine with crystals. They are 1.75 inches in length, ensuring that they will pop out and make the outstanding statement whether you have your hair down or pulled back. Are you a husband or significant other who is looking for a gift for the love of your life? This one is sure to please her and your wallet. Don’t worry about breaking the bank. You can still give her an exceptional gift without the stress. Aside from giving this as a gift for an anniversary or a birthday, we love the idea of wearing these at a wedding. 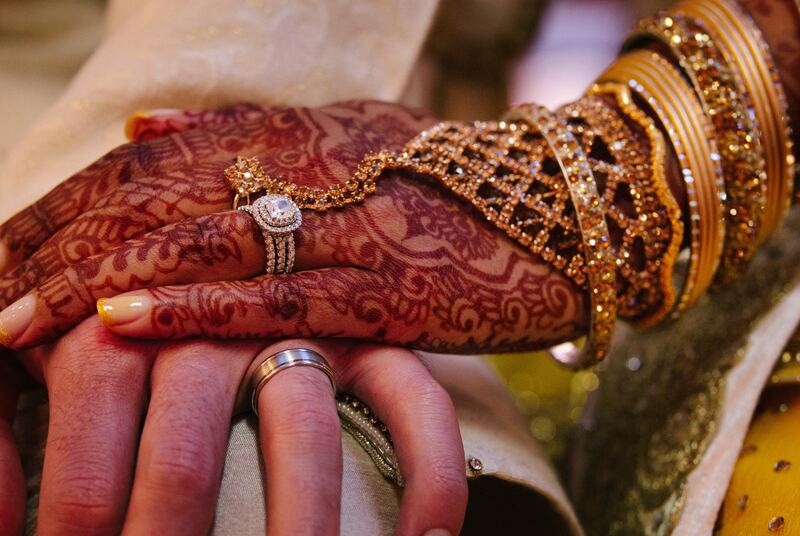 Is there a better time to display your affection and commitment of eternal love than at your wedding? 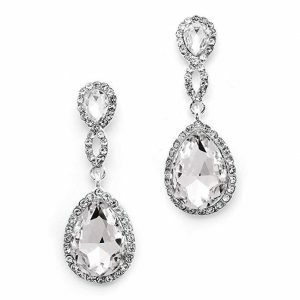 This shining pair screams bride worthy and also would be a charming sentiment for each of your bridesmaids. This concept brings infinity into your relationship with your soon-to-be spouse as well as each of your dearest friends with your matching symbolic earrings. 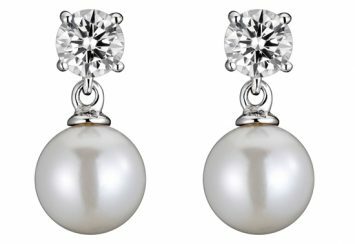 This gorgeous pair of earrings is sure to be a head turner as it, especially the large bottom tear drop, draws in the eyes of the whole crowd on your dream wedding day! Can you picture it yet? These earrings are the icing on the cake as you celebrate your eternal love. We hope you enjoyed our top ten selection today, and even more than that we hope you were just as elated by the choices as we are and you found exactly what you are looking for! 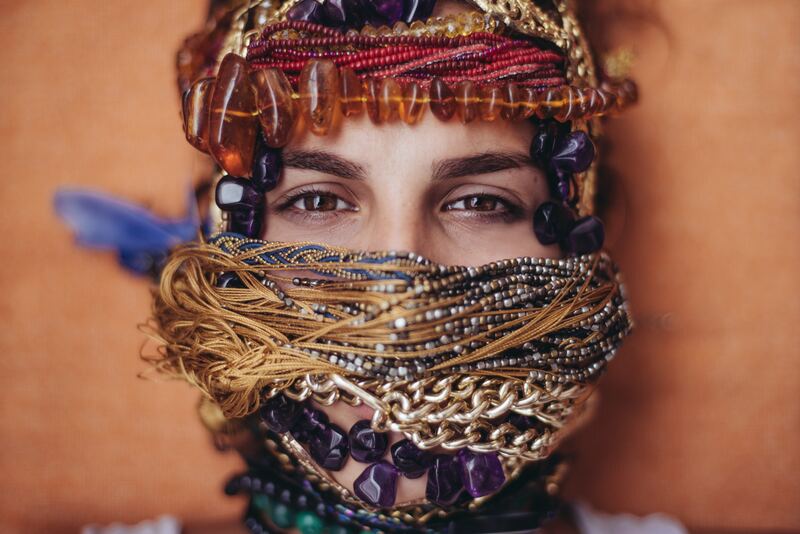 How incredible is it that one piece of jewelry can demonstrate so much power and meaning in our lives? True love is not something that everyone gets to experience in life, and it is such a sacred gift to hold. Each of these infinity symbol jewelry pieces is phenomenal representations of that sacred gift and make it possible to remind yourself, your significant other, and all those you love and hold dear to your heart just how much they mean to you. Whether you are buying for yourself or giving as a gift, or both, don’t forget the message and the depth of love that that little infinity symbol possesses. Love is eternal. Love is everlasting. Love is boundless. That’s the power that the infinity symbol shows each of us, so wear it with pride and a full heart. You my dear, are one of the lucky ones. You have found what we all dream of and long for. You have found your infinity.